Brown forced to ditch his gaudy footwear. Cleat-focused NFL fans may have noticed Pittsburgh Steelers wide receiver Antonio Brown's footwear switch-up this weekend during his game against the Eagles. It turns out that wasn't a personal decision, but one forced upon him by the league. According to DK Pittsburgh Sports, game officials told Brown at halftime that he had to change out of his blue and yellow cleats, which don't conform to league guidelines and have resulted in fines for the receiver before, or stay in the locker room. Per Steelers beat writer Joe Rutter, Brown himself confirmed the story on his radio show this week. 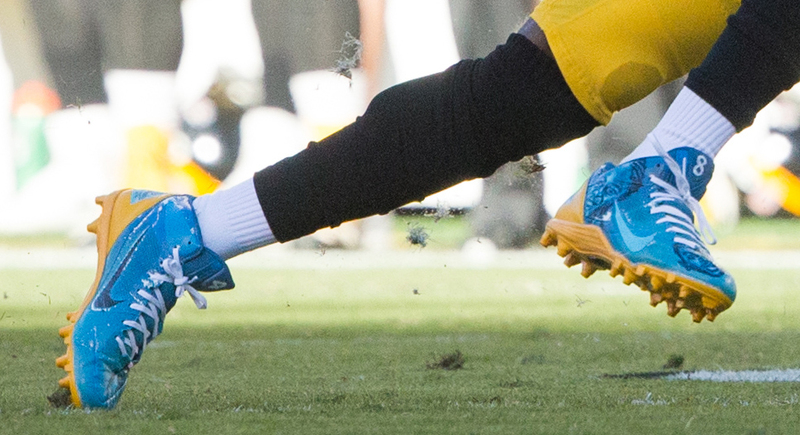 Below are the blue and yellow cleats Brown began the game in.